Thinking of relocating–either your family or your business? We invite you to browse the information here and on other pages of our website. If you have additional questions, please call the Village Office at (608) 759-3721. If you’re looking for a small town with a slower-paced lifestyle and a great quality of life, Benton is just the place for you. Our people have good, rural values and genuinely care about their neighbors and about their community. Our town offers warm, friendly neighborhoods; an excellent, small school system; opportunities for businesses; and close proximity to employment of all types. More and more companies and entrepreneurs are recognizing the benefits of starting businesses in small towns. According to recent studies of business growth, the “Go West, young man” axiom has changed to a new mantra –“Go small, young man.” Land prices, rents, and building costs are typically less in small towns, allowing the extra capital needed to stay afloat in the early start-up years. Small-town labor costs, beautiful settings, affordable housing, and an attractive quality of life are drawing businesses to small towns across the nation. Potential new businesses will find that there is a spirit of cooperation between government and business here in Benton, and we welcome your business endeavors. The village has a new 33-acre industrial park (Benton Business Park Map) on the west edge of town, bordering Highway 11. Building sites are available using a very affordable pricing structure. For information on lot availability and pricing, contact Beverly Hitz, Village Clerk (608) 759-3721. Included in the industrial park is the Benton Business Incubator. The incubator contains multiple business spaces and is capable of accommodating everything from light industry to office space. Not only do incubator tenants pay low rates, but they also have access to a variety of business-assistance services that help them through their first critical years of business. The incubator’s location allows for immediate access to State Hwy. 11, connecting it to major four-lane systems in Wisconsin, as well as to nearby Iowa and Illinois. For additional information, contact the Village Office at 608.759.3721. The Village of Benton is also part of the Lafayette Development Corporation, an economic development organization committed to improved business development, agricultural enterprises, and employment opportunities in Lafayette County. The Benton Community Development Corporation, coupled with the Village, works on a local level to encourage those same types of development in the community. Benton is within 15-20 minutes of the larger communities of Platteville; Dubuque, Iowa; and Galena, Illinois. Dubuque and Galena are Mississippi River towns, both with a great deal of history and Victorian charm. Collectively, they entertain millions of tourists each year and provide employment opportunities for countless numbers of people in the tri-state area. Benton has several higher educational opportunities virtually in our backyard. Platteville is home to the University of Wisconsin-Platteville, a beautiful campus with excellent undergrad and graduate programs. Dubuque has three equally good colleges from which to choose—the University of Dubuque, Loras College, and Clarke University. There are also community and technical colleges within easy commuting distance of Benton. The state’s capital of Madison is less than 1½ hours away. Madison and nearby Dubuque, Iowa, have airports that are easily accessible for travelers and business people. An agent for First Weber Realty, Michelle is a member of Wisconsin Realtors’ Association and of the South Central Wisconsin Multiple Listing Service. Licensed in Wisconsin and Illinois, Lori specializes in residential and land sales but also lists and sells commercial property and farms. She is an Accredited Buyer Representative and a member of REBAC, as well as a Certified Home Marketing Specialist. Larry Teasdale is a licensed real estate agent and a licensed auctioneer in Wisconsin and Illinois. Larry and his staff have many years of experience in real estate sales and auctioneering. The Village of Benton is a not-for-profit, municipally owned electric, water, and sewer utility. A service may be requested by calling the Village Office at (608) 759-3721 or by completing and submitting this online form. Alliant Energy provides natural gas services to Benton. For customer service, call (800) 862-6222. Local phone service for the Village is provided through CenturyLink. Residential customers may call (800) 201-4099 for service; business customers may call (800) 201-4102. If interested in bundling phone and internet services, you can visit the following CenturyLink website www.centurylinkbundles.com. MediaCom is the cable provider for the Benton area. Contact them at (800) 332-0245. Information regarding our government officials and other Village data may be obtained in the “Our Government” section of our website. 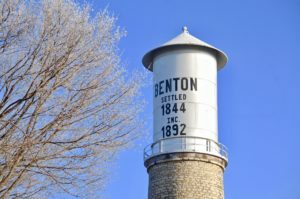 The “Village Services” section of Benton’s website contains information regarding police, fire, and rescue; public works; parks and recreation; garbage and recycling; parking; utilities and billing; and service requests.